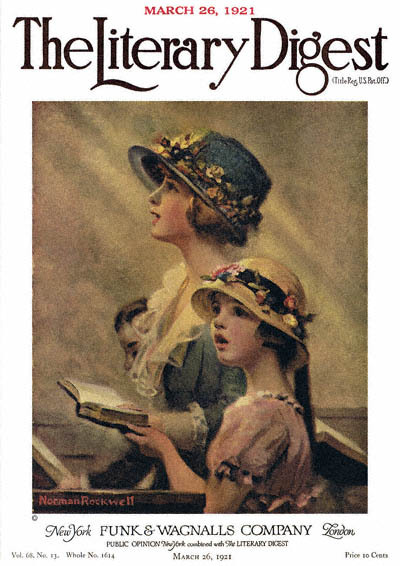 Mother and Daughter Singing in Church, this Norman Rockwell painting, appeared on the cover of The Literary Digest published March 26, 1921. This illustration was Rockwell's twenty-fourth picture featured on the cover of The Literary Digest. This painting also appears on page 55 of Norman Rockwell, A Definitive Catalogue by Laurie Norton Moffatt. In this painting, Norman Rockwell gives us a glimpse into family life at church. Easter Sunday was March 27th in 1921, so this cover illustration appeared the day before Easter. Mother and Daughter Singing in Church was only one of 47 Norman Rockwell Literary Digest covers; here is the list of more Norman Rockwell Literary Digest scans. Families in Rockwell paintings usually have one boy and one girl. This one is no exception. Mother, daughter and son are all lined up in one pew this Easter Sunday. Brother is in the background and is holding his hymnal lower than his pewmates in the picture's main emphasis. The main emphasis of this picture is Mother and Daughter, just as the title suggests. Both mother and daughter are dressed in Easter finery. Both are wearing new dresses bought especially for the occaison. Both are wearing Easter bonnets. Although the bonnets do not match each other, they match their respective outfits wonderfully. Mother and daughter bear a family resemblance. Did Rockwell actually paint models who were mother and daughter for this work?